Life is an adventure and I'm glad to live it every day. There's always something to look forward to. Enjoying family and friends. Time to myself. Learning. Travel. Good food. The changing seasons. The next adventure.... Life is good. 'cause I'm happy just to dance with you." I love that Beatles song, formulaic or not. 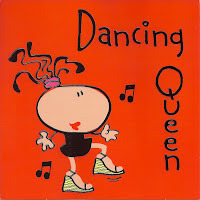 Anyone who knows me well or has been to any social occasion with me knows I love to dance. I'm the first one on the dance floor and the last one off. And I rarely miss a song through the night. I just keep going like the energizer bunny as long as the music "has a good beat and you can dance to it." Dancing just simply makes me happy. I experience a "no care in the world" sense of freedom through dance. And just like the anonymous quote, I dance as though no one is watching. I really don't care if I look goofy as I let loose and give it all I've got. on a popular greeting card. Now I don't know about you, but I don't get out dancing with hubby or girlfriends as much as I'd like. So if dancing is the stress relief my body and soul need, that's not so good for me. But I've found a way to satisfy my need more frequently. Jazzercise®. I'd known about Jazzercise for many years, but just never made the time to try a class. Jazzercise.com tells you that the 60-minute group fitness class combines "dance-based cardio with strength training and stretching to sculpt, tone and lengthen muscles for maximum fat burn." Sounds like a good workout, but the best is that the routines are so much fun! All the latest in music, across all genres, from oldies to classical to hip hop to reggae to pop. There's always a good song to move to. Jazzercise is "a fusion of jazz dance, resistance training, Pilates, yoga, and kickboxing." And they're not kidding when they say you'll dance yourself fit and change the shape of your body! Depending on the intensity you choose, you can burn up to 600 calories in a session! to fit in this dress...literally. I can vouch for their claims since Jazzercise was the exercise that helped me achieve the look I wanted as the mother of the bride for my youngest daughter in 2008. When my daughter got engaged, my one request was that she give me time to get in shape. She said I looked fine, but I went with my gut instinct that I could feel and look better. And I'm glad I did! As a lifetime Weight Watchers® member since 1989, I've always appreciated that eating healthy is a lifestyle, not a diet, but also knew that exercise must play an important role in maintenance, too. And to be honest, at that point I knew I had let work and life get in the way of taking care of myself in the way I knew I should be. Although I certainly wasn't alone when tired at the end of a long day to put off exercise and say I'll work out next time, I knew I needed to find something that would inspire me and keep me motivated, even when I didn't have the energy. I realized that attending Weight Watcher's meetings weekly, instead of monthly, wouldn't be enough. As a self-proclaimed foodie who loves to cook and eat, I knew working out had to be just as important again in my life to get me strong and allow me to continue enjoying the culinary delights I liked. So in January 2008, I knew I needed to kick it up a notch, as Emeril says, to push my metabolism into high gear to get my body and mind in the shape I wanted to be for my daughter's wedding. I joined the Jazzercise program and religiously attended classes three to five times a week. I worked hard and saw incremental results through the year, which motivated me to keep going. By the end of the year at the wedding in December 2008, I had lost 20 pounds and 25 inches to walk before my daughter as the best mother of the bride I could be for both her and myself. Ready to dance with my family. 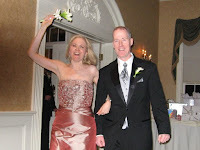 Just as James Brown sang, I felt good, as I was announced with hubby at the reception. I knew I had worked hard through the year, yes, on all the wedding preparations with my daughter, but also to look the best I could for her big day. Dance as if no one is watching. It feels good. Even if it's just at home, by yourself. I've always been a fan of group exercise, from aerobics to step to Pilates to yoga. 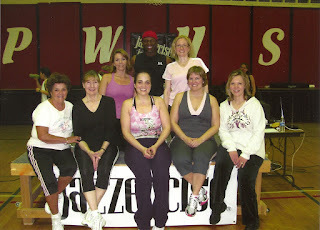 But with no other class on its own did I reap the benefits I saw when I committed to Jazzercise that year. I continued with that commitment and have never looked back. I've been fortunate to find local classes near work and home that combine my love of dancing with exercise. I'm never bored since the music is always changing and the steps are easy to pick up. Every song really only has three or four moves that are repeated, so you become an expert before you know it. And who cares if you miss a step? No one. Just keep moving. You're dancing for you and no one else. So where am I today with Jazzercise, almost four years later? For the first time in many years, I never find excuses to pack my gym bag and I rarely miss the Jazzercise classes I schedule into my week. Why don't I miss as easily as I did with other classes? It certainly isn't because I choose to prepay. I've done that with plenty of gym memberships and classes over the years and I still missed for various "important" reasons. I think the change in attitude now is because I know I'll truly have fun dancing when I get there. I'll relieve the normal stresses of everyday life, get a good workout, and will come away feeling strong with the energy I need to handle whatever challenges lie in front of me. And I've accepted the potential that I'm a better version of me when I take care of myself. As with so many activities I participate in, I've met nice groups of women at any classes I attend. An added bonus with the international Jazzercise franchises is that when I travel for business or pleasure, I'm sure to find a Jazzercise location wherever I am and I've taken advantage of that benefit many times. No matter where I attend, I can jump right in and dance along to familar routines and get a great workout. I've even inspired friends to join me. It's a good thing! with Tim Robbins, professional dancer and choreographer. Now I've had opportunities here and there to try ballroom and belly dancing, disco and country line dancing, ballet, diva dancing to Broadway tunes, and hip hop. I'd love to someday take a zumba or salsa class to mix it up. I don't think I'd ever meet a dance class I wouldn't try. But I don't have easy access to all that right now. So I'm happy with my Jazzercise and the mix of walking, hiking, and yoga that I currently fit in my daily life. Maybe I'll also get back to swimming at some point when I make the time. But for now, JZ, as I affectionately call my weekly Jazzercise routine, does it good for me. During a few recent doctor visits, the doctors said to me independently that I should continue with whatever I'm doing. So I'll heed their advice and keep on Jazzercising, hiking, and doing some yoga here and there. It works for me. But I won't stop looking for other activities that spark a new interest to keep me moving. After all, mixing it up is what makes life exciting. What activities inspire you and keep you going? Let me know what you enjoy. I'd love to hear from you. But if I see you on the dance floor, don't forget to dance like no one is watching! I'm happy just to dance with you. Never a dull moment living with hubby and two tiny pups who keep us very busy. Happy mom to three wonderful adults and their significant others. Loving technology and how it helps us all stay connected. © 2011 Working to Live. All rights reserved. Awesome Inc. theme. Theme images by epicurean. Powered by Blogger.